Background The symptom 'dizziness' is common in patients with chronic whiplash related disorders. However, little is known about dizziness in neck pain patients who have not suffered whiplash. Therefore, the purposes of this study are to compare baseline factors and clinical outcomes of neck pain patients with and without dizziness undergoing chiropractic treatment and to compare outcomes based on gender. Methods This prospective cohort study compares adult neck pain patients with dizziness (n = 177) to neck pain patients without dizziness (n = 228) who presented for chiropractic treatment, (no chiropractic or manual therapy in the previous 3 months). Patients completed the numerical pain rating scale (NRS) and Bournemouth questionnaire (BQN) at baseline. At 1, 3 and 6 months after start of treatment the NRS and BQN were completed along with the Patient Global Impression of Change (PGIC) scale. Demographic information was also collected. Improvement at each follow-up data collection point was categorized using the PGIC as 'improved' or 'not improved'. Differences between the two groups for NRS and BQN subscale and total scores were calculated using the unpaired Student's t-test. Gender differences between the patients with dizziness were also calculated using the unpaired t-test. Results Females accounted for 75% of patients with dizziness. The majority of patients with and without dizziness reported clinically relevant improvement at 1, 3 and 6 months with 80% of patients with dizziness and 78% of patients without dizziness being improved at 6 months. Patients with dizziness reported significantly higher baseline NRS and BQN scores, but at 6 months there were no significant differences between patients with and without dizziness for any of the outcome measures. Females with dizziness reported higher levels of depression compared to males at 1, 3 and 6 months (p = 0.007, 0.005, 0.022). Conclusions Neck pain patients with dizziness reported significantly higher pain and disability scores at baseline compared to patients without dizziness. A high proportion of patients in both groups reported clinically relevant improvement on the PGIC scale. At 6 months after start of chiropractic treatment there were no differences in any outcome measures between the two groups. Gender differences in reporting pain intensity is currently a topic of debate. Recent research suggests that females report more pain because they feel pain more intensely than males over a variety of musculoskeletal complaints. [10, 11] Furthermore, LeResche suggests that these differences may not be taken into account by health care providers, leading to less than optimal pain management for females. However gender differences in neck pain patients with or without dizziness have not been described with respect to clinical outcomes over time. This is a prospective cohort study with 6 month follow-up. Ethics approval was obtained from the Orthopaedic University hospital Balgrist and Kanton of Zürich, Switzerland ethics committees (EK-19/2009) and written informed consent was obtained from all patients. Consecutive new patients over the age of 18 with neck pain of any duration who had not undergone chiropractic or manual therapy in the prior 3 months were recruited from multiple chiropractic practices in Switzerland. All 280 members of the Swiss Association for Chiropractic were invited to participate in the study and 81 practitioners from both the German and French geographic regions of Switzerland chose to enrol patients. There were no set number of patients required from participating clinicians and all chiropractors were strongly encouraged during meetings and with frequent e-mail reminders to enrol all qualifying patients. Patients with specific abnormalities of the cervical spine that are contraindications to chiropractic manipulative therapy, such as tumours, infections, inflammatory arthropathies, acute fractures, Paget’s disease, cervical spondylotic myelopathy, known unstable congenital anomalies and severe osteoporosis, were excluded. Additionally, patients on anticoagulation therapy were also excluded. Information provided by the treating chiropractor at the initial consultation included: patient age, gender, marital status, whether or not the onset of pain was due to trauma, whether or not the patient smokes, whether or not the patient was currently taking pain medication, duration of current complaint, number of previous episodes, whether or not the patient also complained of dizziness and the patient’s general health status (good, average or poor). This information was completed on a baseline information form. For dizziness, patients were asked to report if they currently experienced ‘dizziness’ which was described as feelings of ‘light-headedness’ or faintness or disorientation or unsteadiness or reduced postural and balance control that was related to their neck pain. 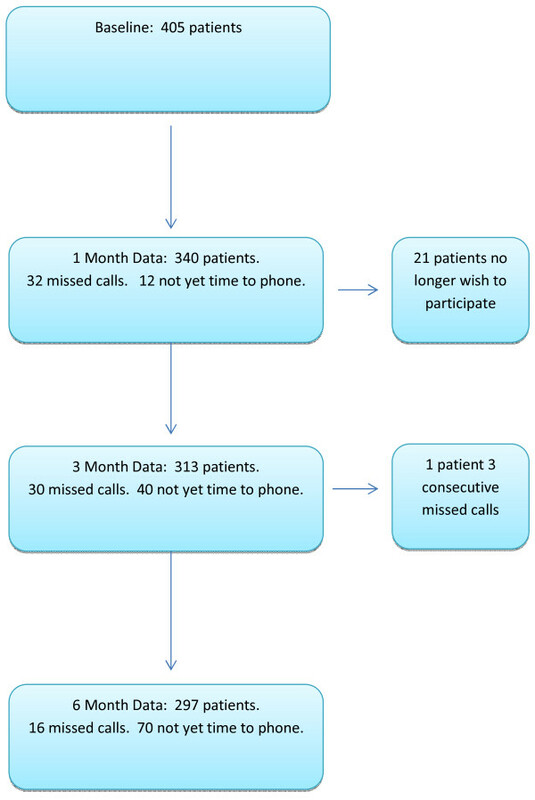 Additionally, data from the NRS (neck), NRS (arm), and the BQN were also collected as secondary outcome measures at 1 month, 3 months and 6 months after the start of treatment via telephone interviews (Figure 1). These telephone interviews were conducted by research assistants at the university hospital who were unknown to the patients. Evaluation of differences between the patients with and without dizziness for the demographic categorical variables was done using the Chi-squared test. Differences between the patient ages and the baseline NRS and BQN subscale and total scores for the two groups were calculated using the unpaired Student’s t-test. The proportion of patients with and without dizziness reporting ‘improvement’ for their neck pain on the PGIC scale was calculated at each data collection time point. For those patients with dizziness, a separate PGIC was used to report ‘improvement’ specifically for their dizziness complaint. The Chi-squared test was used to assess differences in the proportions of patients ‘improved’ for their neck pain between these two groups. Evaluation of the frequency distributions of the NRS and BQN subscale and total scores was done to determine whether or not they were normally distributed. As they were determined to be quite normally distributed, assessment of differences between the NRS and BQN subscale and total scores as well as the change scores for the two groups at all follow-up time periods was calculated using the unpaired Student’s t-test. The Mann Whitney U test for nonparametric numerical data was used to compare the follow-up mean PGIC scores between the two groups. Within group comparisons between the baseline NRS and BQN scores and outcomes at all time points were done using the paired t-test. Differences between males and females for categorical baseline variables, including the presence or absence of ‘dizziness’, were assessed using the Chi-squared test. Comparison of the genders for age, baseline NRS (neck), NRS (arm), BQN subscale and BQN total scores were done using the unpaired Student’s t-test. Male and female patients with and without dizziness were compared for the proportion reporting ‘improvement’ on the PGIC scale at 1, 3 and 6 months and the Chi-squared test was used to investigate a gender difference in ‘improvement’. The unpaired t-test was also used to compare the follow-up NRS and BQN scores between the genders. Within gender differences in follow-up NRS and BQN scores compared to baseline scores were assessed using the paired t-test. Four hundred and five neck pain patients with baseline data who had consented to be part of the Chiropractic Outcome Study in Switzerland were included in this study. Eighty-one or 29% of the 280 members of the Association of Swiss Chiropractors recruited patients for this study from the two largest geographic regions of Switzerland (German and French). Of the 405 patients, 177 (44%) reported neck pain and related dizziness while 228 reported that they had neck pain without dizziness. Baseline demographic factors comparing patients with and without dizziness are shown in Table 1. A significant majority of the patients with dizziness were female. In addition to being female (p = 0.001), neck pain patients with dizziness were more likely to be smokers (p = 0.04). At baseline neck pain patients with dizziness reported statistically significantly higher levels of neck pain, arm pain, physical and social disability, anxiety, depression, work fear avoidance and less control over their pain condition (locus of control) compared to those without dizziness. As a result, the BQN total scores were significantly different between those with and without dizziness, being significantly higher in neck pain patients with dizziness (p = 0.0001) (Table 1). There was a steady report of increased improvement for both neck pain and dizziness at each of the three follow-up data collection periods with no differences in outcome between patients with and without dizziness (Table 2). Tables 3, 4 and 5 show the actual PGIC mean scores (+/- standard deviations) for the two groups. By 1 month after the start of treatment, the only areas where the neck pain with dizziness patients reported significantly higher scores were arm pain, social disability and depression (Table 3) but there was no significant difference in the BQN total score between the two groups. Three months after the start of treatment only social disability and depression were scored significantly higher in patients with dizziness (Table 4) and by 6 months there were no significant differences between neck pain patients with and without dizziness for any of the outcome measures due to the significantly higher baseline to 6 month change scores in the BQN subscales ‘physical disability’, ‘anxiety’, ‘depression’ and ‘locus of control’ for patients with dizziness (Table 5). There was a significant association between being female and reporting ‘dizziness’ (p = 0.001) with 133 of the 177 patients stating that they had neck pain and dizziness being female (75%). Comparing male and female patients with and without dizziness, there were no significant gender differences for age, duration of complaint, presence of radiculopathy, trauma onset, smoking, general health or baseline report of neck pain or arm pain. Females with and without dizziness reported significantly higher baseline scores for ‘depression’ compared to males with and without dizziness, with the scores being higher in the patients with dizziness compared to those without. There was no significant difference in the proportion of males and females with and without dizziness who improved at any time point and both genders with and without dizziness reported significantly improved NRS and BQN scores compared to baseline at all follow-up time points. Table 6 shows the percentage of males and females with dizziness who ‘improved’ specifically for their dizziness complaint at each time point. The findings from this study are very encouraging for neck pain patients undergoing chiropractic treatment who also suffer from dizziness. A high proportion of neck pain patients with and without dizziness reported clinically relevant improvement at 1 month, 3 months and 6 months, with 80% of patients with dizziness reporting that they were significantly ‘improved’ specifically relating to their dizziness symptoms at 6 months. Only the scores of ‘much better’ or ‘better’ (1 or 2) were counted as clinically relevant improvement. ‘Slightly better’ was not considered to be improved in order to error on the side of caution. [16, 17] Statistically significant decreases in all secondary outcome measures at every data collection time point were also found for both groups, although arm pain was somewhat slower to respond in females. However, the low mean baseline NRS scores both for the patients with and without dizziness shows that compared to other pain, disability and functional measures, arm pain was the least problematic. It is important to point out that at baseline neck pain patients with dizziness reported significantly higher scores for severity of neck pain, arm pain, all subscales on the BQN as well as the BQN total score compared to the neck pain patients without dizziness. However, over time fewer differences between these two groups were found with no significant differences between the two cohorts at the 6 month data collection time point. Depression and social disability were the two categories that remained significantly different at one and 3 months. However, although significant, the mean scores at 3 months of 1.35 and 0.81 for depression and 0.83 and 0.43 for social disability are very low on the 11 point BQN subscales so it can be suggested that these differences are clinically unimportant. The BQN subscale ‘depression’ stood out as the most dramatic difference between patients with and without dizziness as well as between males and females with and without dizziness. It was nearly 2 points higher in the patients with dizziness at baseline but also demonstrated the most dramatic change score at 6 months of nearly 3.5 points. At that time point the mean score was no longer significantly different compared to patients without dizziness. It was somewhat surprising to find that nearly 44% of neck pain patients presenting to Swiss chiropractors stated that they had associated dizziness. However, the fact that 75% of neck pain patients with dizziness in this study were female is not surprising. It is well documented that females are more likely to suffer from neck pain in general [10–12] and that a large proportion of chronic whiplash sufferers report symptoms of dizziness and unsteadiness. [7, 8] However, what is unusual in this study is that there was no difference between neck pain patients with and without dizziness in terms of a trauma onset. The fact that only 29% of practicing chiropractors contributed patients to this study may also be a limitation as it is unknown whether or not this sample is representative of the greater chiropractic population. Additionally, some chiropractors contributed several patients and others only a few. It is known however, that chiropractors from the two largest geographic regions of Switzerland submitted patients and that those participating had a wide range of practice experience. Additionally, all Swiss chiropractors must complete a two year full time post-graduate residency programme with a fairly standardized curriculum and pass a rigorous post-graduate examination in order to practice as independent chiropractors in this country. It is known from the Swiss job analysis study published in 2010 that the ‘diversified’ manipulative technique is applied to the majority of patients by the vast majority of chiropractors. Additional commonly applied therapies include trigger point therapy, advice on activities of daily living, therapeutic exercises and mobilization techniques. Thus differences in practices here may be less dramatic than in other countries. Finally, the use of multiple, uncorrected statistical tests may be another limitation to this study. In particular the large number of statistical tests used in this study may have resulted in a chance-statistically significant finding (one significant finding per 20 tests if p<0.05). Further exploration of predictors of improvement for neck pain patients with dizziness should use multiple regression analysis. A high proportion of patients with and without dizziness reported clinically relevant improvement at 1, 3 and 6 months. Although neck pain patients with dizziness undergoing chiropractic treatment reported significantly higher pain and disability scores at baseline compared to neck pain patients without dizziness, there were no significant differences in any outcome measures between the two groups at 6 months after start of treatment. Neck pain patients with dizziness were much more likely to be female and females with dizziness report higher levels of depression compared to males with dizziness at all data collection time points. BKH: Concept and design of the study, analysis and interpretation of data, drafting and revising the manuscript, final approval of the manuscript. CKP: Collection and entry of data, analysis and interpretation of data, drafting and revising the manuscript, final approval of the manuscript. The authors thank the numerous Swiss chiropractors contributing patients for this study. The authors also thank the Uniscientia Foundation, the European Academy for Chiropractic and the Balgrist Hospital Foundation for providing grants for this study. J Neurol Neurosurg Psychiatry. 2001 (Jul); 71 (1): 8–12 No abstract available.